Chiranjeevi feels that Rangasthalam has the makings of a classic. There can be no denying that Ram Charan is one of the most talented and popular stars in Telugu cinema today. During his reasonably eventful career, he has found firm footing in the industry thanks to his raw looks, sincere performances and charismatic personality. Moreover, he has won the love of fans because of his cool nature and cool attitude. Now, there is some terrific news for his fans. 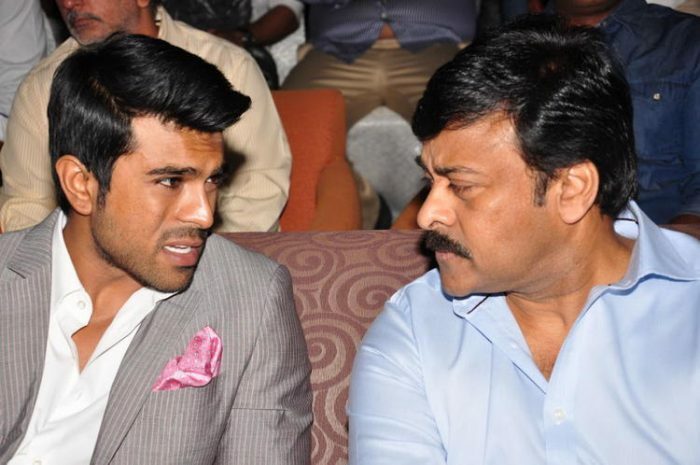 According to a leading daily, megastar Chiranjeevi recently a few rushes of his eagerly-awaited ‘Rangasthalam’ and gave it the proverbial thumbs up. Confirming this, a source said that Chiru felt ‘Rangasthalam’ has come out well and has the makings of a classic. “Recently, Chiranjeevi along with Rajamouli and others saw the rushes of the film and were surprised to see that the film has come out beautifully, almost like a classic. He is satisfied with the way the film has shaped up,” added the source. Well, this some good news and is bound to create a buzz amongst Charan’s fans. In case you did not know, ‘Rangasthalam’ is touted to be a romantic-drama and is being directed by Sukumar. In it, Charan will be seen alongside Samantha Akkineni. Interestingly, ‘Rangasthalam’—which hits screens next year—will be Charan’s first release after ‘Dhruva’ and has created a buzz amongst his fans. As it so happens, at present, the actor is also busy with the production of ‘Sye Raa Narasimha Reddy’ which features Chiranjeevi in the lead. So, are you looking forward to ‘Rangasthalam’? Tell us in the space below.